Samsung is very determined to become the number one name in the camera market, with the company currently at number two and snipping at the heels of Canon who currently owns around 20 per cent market-share. 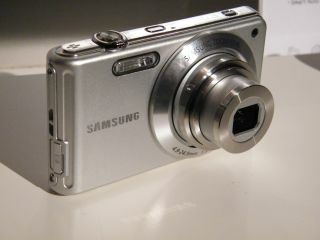 To achieve this, Samsung is offering up a whole host of different camera ranges to suit individual needs. Top of the style pile is the Samsung ST70. Launched alongside its smaller brother the ST60, the super-slim snapper (just 16mm) is looking to capture the attention of the fashion crowd with its good looks. Aside from looks, though, and the T70 is packing some great specs. On-board is a 14.2MP sensor and a 27.5mm wide-angle lens, which takes in a large amount of the scenery around you, relaying it into a nice and bright image. To hold, the camera benefits from having a thin chassis, as it fits in the hand well but doesn't feel too flimsy. Ergonomically, the camera is certainly set up for the frequent picture taker. When it comes to the T70, it's all about slants – both the bottom of the camera and the shutter button are slanted but for different reasons. The shutter is slanted to make it easier to press when the camera is prostrate in your hand. When it comes to the bottom of the camera, this is to help with taking self-portraits. Put it on to a flat surface and it will point at a welcoming seven degree angle, perfect for taking shots of yourself without a tripod. Flip the camera over and you have a reasonable 2.7-inch screen. It's not the brightest we have seen and it's certainly not the biggest but it does look more than apt for shuffling through images and lining up shots. To help with your picture-taking there's a number of new modes found within the camera's menus – the most standout being DeFog. While we couldn't test the camera out in a foggy situation, Samsung assures us it makes it easier to see subject in poor visibility. There may not be fog everyday to deal with, but when you realise you can use this mode to cut through the dry ice on a dance floor and the inclusion of the feature starts to make a bit more sense (if you're into chest rugs and glitter balls). Available in a multitude of colours – including black, purple and turquoise – the Samsung ST 70 and ST60 cameras have a release date of February and will cost £179.99 (ST70) and £149.99 (ST60). Go to www.samsungcamera.co.uk for more details.